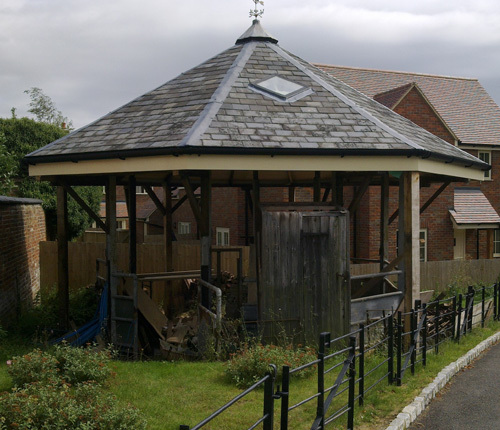 Winslow cattle market thrived for many centuries and lasted into the 21st century unlike the livestock market in neighbouring Buckingham. 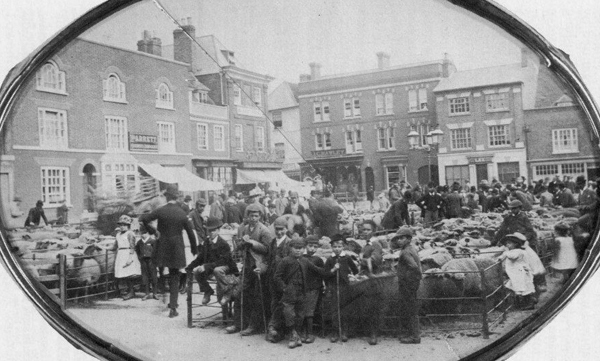 Originally, the cattle markets were held in the Market Square itself. Have a look at the advertisement from a trade directory of 1853 (right) and you’ll see that Market Ordinary Dinners were held at the adjacent Bell and George Inns from noon. Most of the trade would have ended by lunch but farmers would give their sticks to local lads who would keep an eye on the penned animals whilst their owner supped. The writer’s uncle, Henry Grimsdale, tells of performing such a role in the Aylesbury Cattle Market during the 1930s. The grateful yeoman farmer would return full of ale and victuals and award Henry sixpence. Do look again at the advert, perhaps at the section reminding customers that before and after Old Michaelmas [10 October], they could hire servants (and runaways). How appalling that in our country which abolished slavery in 1833, servants remained twenty years later as chattels and little more than an “h” and a reordering of letters away from cattle in terms of their public treatment. 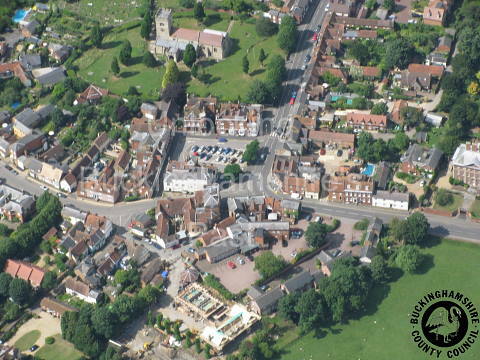 Once the turnpike to Buckingham was completed in the 18th century, traffic through the Market Square increased rapidly and the trend was exacerbated when steam & internal combustion engine machines appeared on the roads of North Bucks. Fast traffic and plodding beasts were an unfortunate combination so the Cattle Market moved in 1875 to Wigley’s Yard, owned by a family of local auctioneers [see below]. It wasn’t far away from Winslow Market Square and it was still connected to Horn Street and not far from Sheep Street, themselves reminders of a past when the transport of beasts to and from market were vital to Winslow’s economy. Permanent buildings are shown on the site in the 1899 Ordnance Survey map (but not in 1885). The annual Sheep Fair was held in September. The photo shows one on the Market Square c.1896. 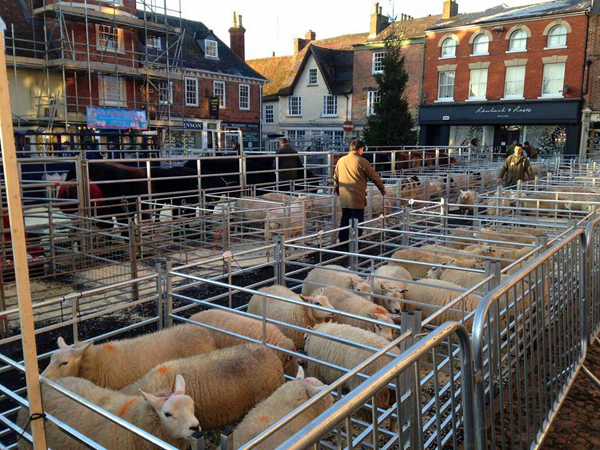 The Christmas Primestock Show returned to the Market Square in December 2014. In 1850, immediately after the Station opened, James King established his own regular sales, taking advantage of "the facility and cheapness of transit afforded by the Buckinghamshire Railway". Winslow market closed at the end of 2007 but re-opened as “Winslow Market” at Foscote on land belonging to the Pullin family, a few weeks later in 2008. Wigley’s yard was sold for development, much to the dismay of many locals. Only the auction ring, built between 1899 and 1925, remains (shown in 2011) from the site of the Cattle Market, retained as a planning condition. The new houses have been named Limes Court after the lime trees which have been on the site at least since the 1885 Ordnance Survey map. This aerial photograph (© Michael Farley, used with permission) shows building work in progress on the former cattle market at the bottom of the picture. In January 1870, Dudley & Son, who had been established in Winslow for a considerable number of years, and at the latest 1815, opened a market on alternate Wednesdays in a yard adjoining the Nags Head in Sheep Street. In December of that year they held a Christmas show on the same premises. The following year 1871 some prime cattle for Christmas were included in the fortnightly sale. Records from the Bucks Express show that at that time the fortnightly sales on the Market Square had lapsed. The 4th February 1874 saw the re-introduction of sales on the Square. Harrison & Son, who had a business in Buckingham, where they also ran the market, again opened up the livestock market on the first and third Wednesdays in the month. So for a period, there were two livestock markets which from time to time coincided on a Wednesday. Harrisons office was at the Kings Head Inn, in the High Street. This venture did not flourish, and the Market Square sales ceased at the end of 1874. However further competition came to Dudley & Son following the death of the son. George Wigley, who had run the agricultural side of the business for a number of years, broke away to inaugurate a market on the present site. 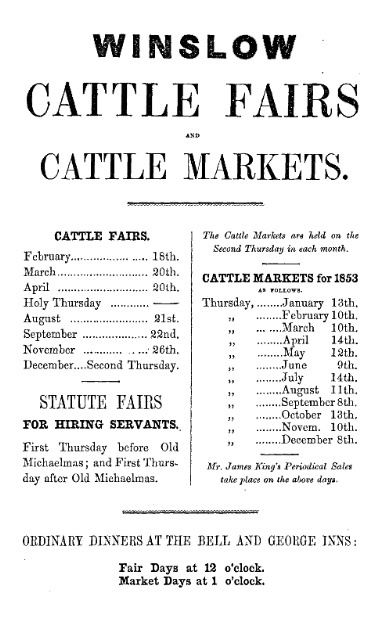 On 6th January 1875, the first market was held. Two Christmas shows were held that year. One by George Wigley at 11.30 in the present market and the other, with typical agricultural timing was scheduled for 12 noon for 1 o'clock at Dudleys premises in Sheep Street. There was no sale on the Market Square. This pattern of marketing continued until the end of 1881, when Dudleys closed their premises in Sheep Street. One market only continued until the next revision of arrangements, which was the moving of the Market Day to Mondays in 1887. Complaints over the condition of the Square, which belonged to the Lord of the Manor, William Selby Lowndes, were received from the Board of Agriculture as the result of which, the Christmas Shows for 1889-1894 reverted to the Market sale yard. During this period other developments had taken place. A meeting was convened at the Bell Hotel on the 11th August 1886, attended by a number of local farmers, the descendants of some whom continue to farm in the area. It was resolved to hold an open Fat Stock Show that year. The elected President was W.G. Lowndes and the secretary G.D.E. Wigley. A committee formed at that initial meeting resolved to hold the 1888 show on the Square, and to hold a public dinner at the Bell Hotel at 4.30 in the afternoon. November 1895 produced complications when W. Selby Lowndes offered to sell his rights on the Market Square to the Parish Council. A meeting of that Council agreed in December not to accept the offer until the Square was put in order. An appeal was made to the town in 1897, organised by William Neal. A further appeal for £110 to meet the finishing work was made in 1898. 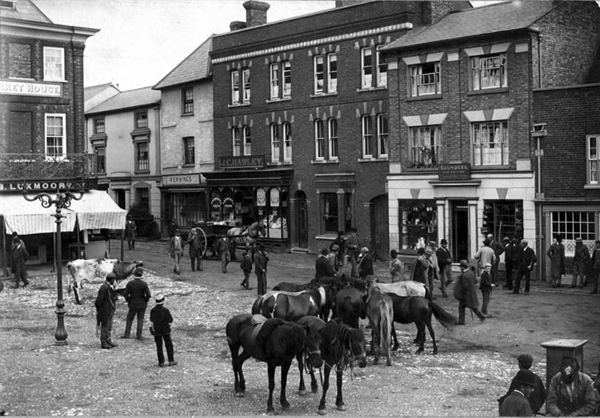 Continuing the endeavour to preserve the Square for livestock sales, the Fat Stock Exhibitions of 1895-97 were held there, but the sales were held in the market. From 1898 onwards, no further shows or sales took place on the Square; following the resolution of a show meeting on the 5th October of that year, and it must be assumed that sufficient funds were not forthcoming to complete the repairs to the Square. Fortnightly Sale of Fat & Store Stock, in Winslow Market, by Messrs Dudley & Son. Fortnightly Sale of Fat & Store Stock, In Winslow Market, by Mr. Geo. Wigley. Sale of Stock, in Winslow Market, by Messrs Harrison & Son. IN HIS SALE YARD, near the Bell Hotel, Winslow, commencing with the Sheep at half-past 10 for 11 punctually. In their SALE YARD, SHEEP STREET, WINSLOW, Commencing at Half-past Eleven o'Clock to a minute. All Stock should be in the Yard by 10 o'Clock. 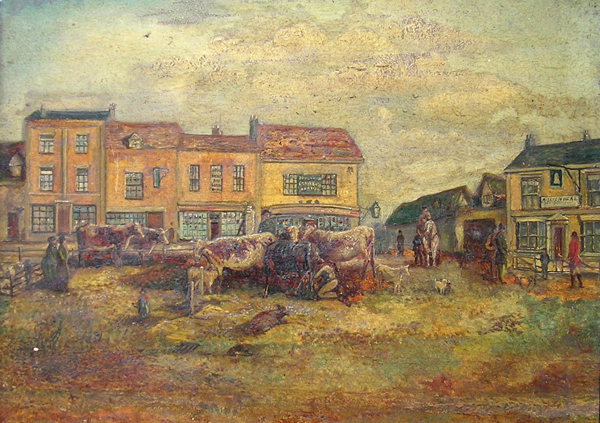 It appears that the painting represents (perhaps after the event) the last regular livestock market on the Market Square, before Dudleys and Wigleys moved to their separate premises on 20 Jan 1875. The photo below from c.1900 shows the aftermath of one of the occasional fairs which continued to be held there. You can hear some extracts from a recording of the livestock market which seems to have been made in the late 1960s. It took place at Wigley's sale yard in Bell Alley, shown in the photos after it had gone out of use and before it became a small housing estate. The first part of the recording is a sale of pigs, the second part is beef cattle (probably after the Christmas Fatstock Show). 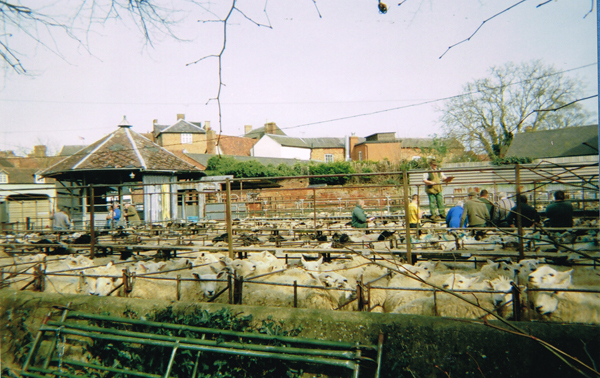 The photo below was taken at the last Sheep Fair in the old Cattle Market, in 2007 (thanks to Tony Walker). The Christmas Fatstock Show has been held on the Market Square since 2014, when the photo below was taken by Terry Foley.